Purchased this set of matching front and rear fenders for my sons 2013 CRF150R, fit was perfect! Fast shipping right to our door, he is excited to ride this weekend. 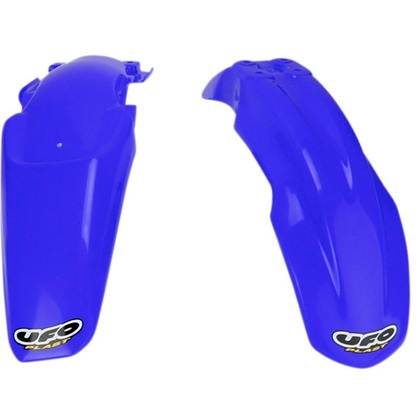 This front and rear fender kit from UFO will not fit the 1999 Honda CR250R. They only fit CR250R models back to the 2004 model year. We do have the 1999 CR250R front and rear fenders available separately to fit your machine. Check out the Honda CR250R UFO Front Fender and CR 250R UFO Rear Fender. You'll notice that, when you go to select the color, you'll also see year ranges there. Those ranges denote the color that'll match the OEM colors, not the bike that they fit. Since you have a 1999 model CR250R, choose the 92-99 CR Red to get brand new fenders that'll match the 1999 model year CR250R. The newest-looking front fender you could use on your bike comes in the form of the UFO Restyled Front Fender. As for the rear fender, unfortunately, no one makes one that's of a newer shape that'll fit the '04 YZ450F. In that case, you'd have to go with a UFO Rear Fender that's the same shape as the stock item.